My Corexy runs two titans with a water cooled Cyclops+. For a first start I defined one tool to run both Titans 50%/50%. I loaded red and yellow PLA and the first xyzcubes came out relatively nice (left). Now I have extruding inconsistencies with the same Gcode file (mid) and sometimes extreme results (right). The skirt (front) shows, that it's not a Z-axis problem. Duet dashboard shows no unusual temperature fluctuation. I printed a lot of cubes and the shown ones are examples only, so it's not a one-time problem. Perhaps one of the Titans is skipping steps, or losing its grip on the filament? I understand that PETG works better than PLA when using mixing extruders. I've had similar issues using Diamond hot ends (3 or 5 in, one out). 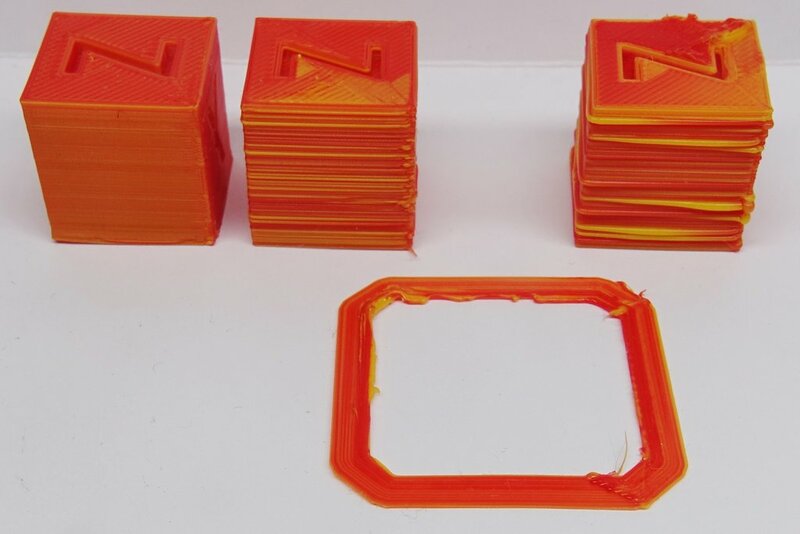 It looks generally over extruded, and in this case there seems to be more yellow in the "failed" prints. What happens with PLA is that it hydrolyses (becomes less viscous or more "runny") when left at print temperature for prolonged periods. Although usually, you get a sort of runny mess when you start to use it and then it clears once fresh filament starts to come through. So that may not be the issue in this case. Try purging 50 or 100mm of filament immediately before doing another print - to get rid of any filament that may have "cooked". Try printing at a lower temperature - the lowest that you can get away with. Yes, mixing got worse from left to right and it is the yellow, that protrudes. What makes me wonder ist the left (and some more cubes) looking fine. I'm not aware of any changes of the setup or config or gcode after that. I've done both today, but it makes no difference so far besides that one Titan starts skipping on the filament at the low temperature (195 instead of 205). The cubes are similar to the middle and right one, so no use in posting another pic. No skipping with 205, fixed for 195°C too by adding some spring tension. Next I will try some other PLA brand and PETG too. Will come back. Might take some days. I'm clueless. What in changing the filament corrects the overall setup to work properly again? BTW the color mixing is far from perfect. Sometimes the filament is leaving the nozzle one side green, one side blue. @peter_o Yes that's odd. With your earlier cubes, it looked to me like the Yellow was being over extruded rather than the Red being under extruded. For sure, I have noticed differences with different coloured filaments but not as extreme as the results that you had. As for the mixing (or lack of) - welcome to my world. This isn't a PLA problem, it's to do with the nozzle itself. There isn't yet a mixing hot end that actually mixes. They all "combine" filaments but what comes out of the nozzle is akin to stripey toothpaste. One trick you can employ is to use transparent filaments which will give the illusion that they are mixed. PETG is better than PLA but only in so far as it doesn't hydrolyse. So you can hold it at print temperature for an extended period of time without it getting too "runny". Any issue you have mixing PLA will still be present when using PETG. BTW, this is all from my years of battling with Diamond hot ends - both 3 colour and 5 colour. You might find some useful info in my blog (linked in my sig). With all due respect, it has nothing to do with PLA. The stripey toothpaste effect is due to the way that filaments are introduced into "mixing" nozzles where they get combined but do not get mixed. It happens with any filament - not just PLA. @deckingman: BTW, this is all from my years of battling with Diamond hot ends - both 3 colour and 5 colour. You might find some useful info in my blog (linked in my sig). I found your blog right from the beginning, when I started to read about dual hotends in this forum. I read all your posts there alrady and found it very educating. It might be the best source on the net about dual extrusion. Thanks for writing it down! As soon as my defective calipers are up and running again, I will check the diameter consistency of the yellow filament. Further research on the strange extrusion will be postponed until it comes up again. My next step will be to test PETG, then try to run the Cyclops as an color switching hotend. Already got the idea of 95/5 configs to avoid filament grinding. Ahhhh, thanks man. I seldom get any positive feedback so it's nice to know that sharing my experiences has been helpful to someone. @deckingman: ... so it's nice to know that sharing my experiences has been helpful to someone. Oh, it is ideed. Be sure of that! From our small local Blog (www.drucktipps3d.de) we know that most of the people are silent readers. 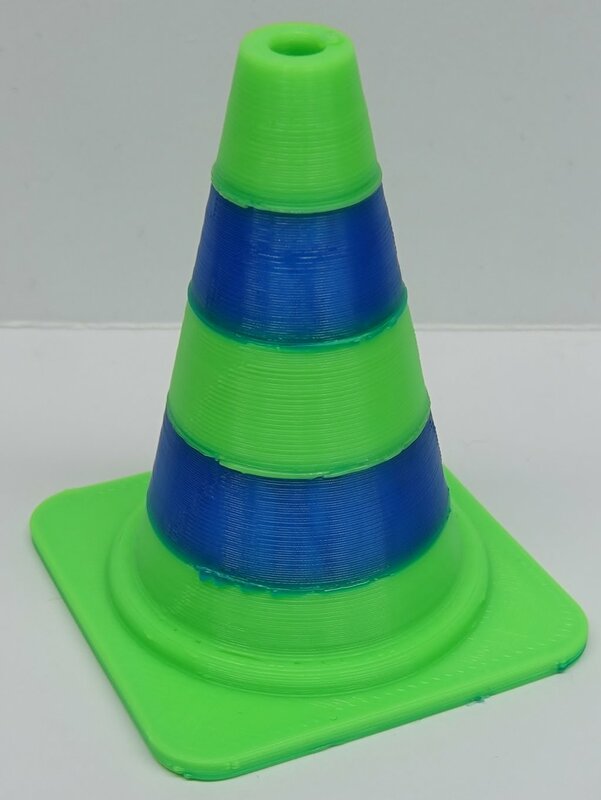 BTW: Here's a first traffic cone (https://www.thingiverse.com/thing:21773) with 100/0 - 0/100 mixing extrusion. Far from perfect, but it's a point to start from.